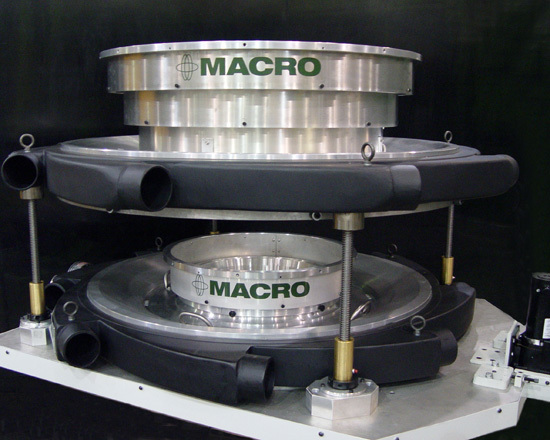 D10 -B Binary Air Rings - Macro Engineering and Technology Inc. The primary air ring pre-cools the resin, stabilizes the bubble and provides high velocity air to shield the bubble from plant fluctuations that can disrupt gauge uniformity. The secondary air ring replaces the first air stream with a new, more turbulent air stream. The highly turbulent second air stream provides the enhanced cooling that leads to significantly higher throughput rates. The effective cooling also allows the bubble to be drawn to its final shape relatively quickly, producing film that has excellent clarity and gauge. 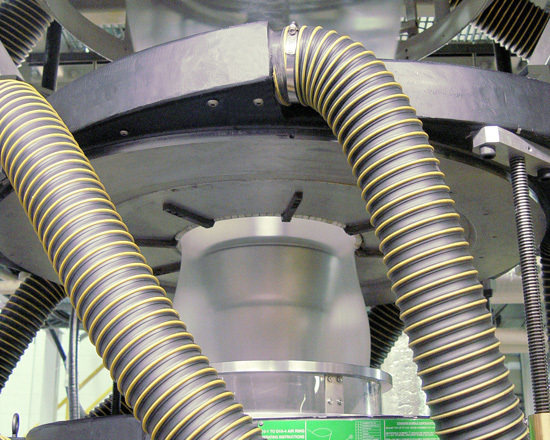 The distance between the air rings is easily adjusted with the elevating mechanism to optimize the amount of cooling supplied by the primary air ring. 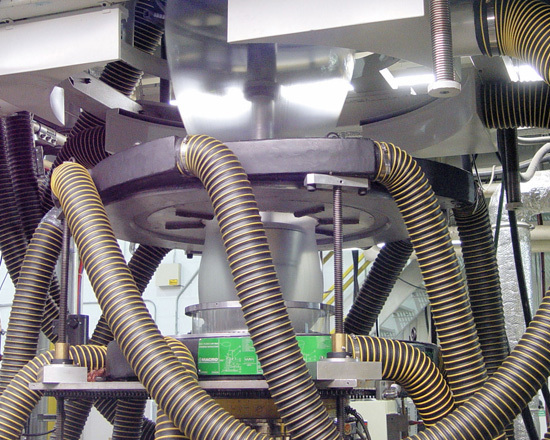 The goal is to allow the molten polymer to cool and gain strength, yet remain in a molten state for a prolonged time to relieve the polymer of extrusion stresses after leaving the die. This results in a low stress polymer that is balanced between the machine direction and transverse direction before passing the secondary air ring for final cooling, solidification and final orientation. To obtain maximum benefits of the secondary air ring cooling system a bubble stabilizing cage that maintains a near-complete 360° contact with the bubble, such as a curved-arm cage, should be used. The stabilizing contact provided by the cage helps to keep the bubble steady in the turbulent air stream. The use of internal bubble cooling and automatic gauge control dies can also improve output and gauge uniformity.